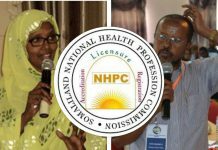 Chances are you may not have heard of Transparency Solutions, but it is one of the largest Non-Governmental Organizations in Somaliland, and has a staff of over a dozen in Hargeisa and across Somaliland. Transparency Solutions Staff in Hargeisa. According to their website, they are a strategic partner of the world renowned University of Bristol in England. Many of the organization’s current and former staffers – including its founder, Mr. Latif Ismail – have worked as Research Associates in the School of Sociology, Politics and International Studies (SPAIS) of Bristol University. 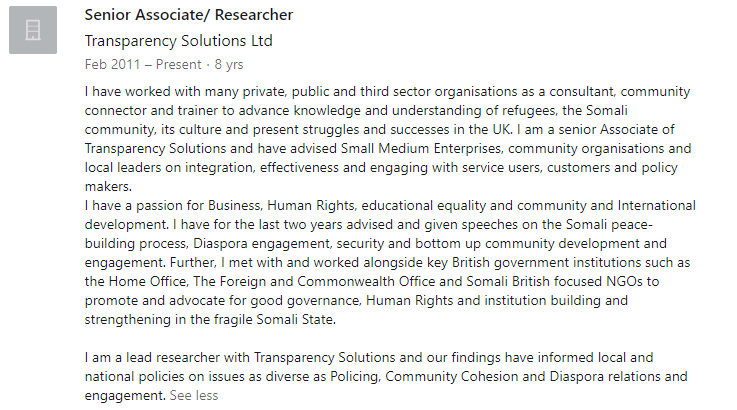 Transparency Solutions’ work is focused on both Somaliland and Somalia, and is a specialist firm in research and sociology studies, but the bulk of their work is on the other side of the border, where many of their staff have gone on to work for the Somali Federal Government. 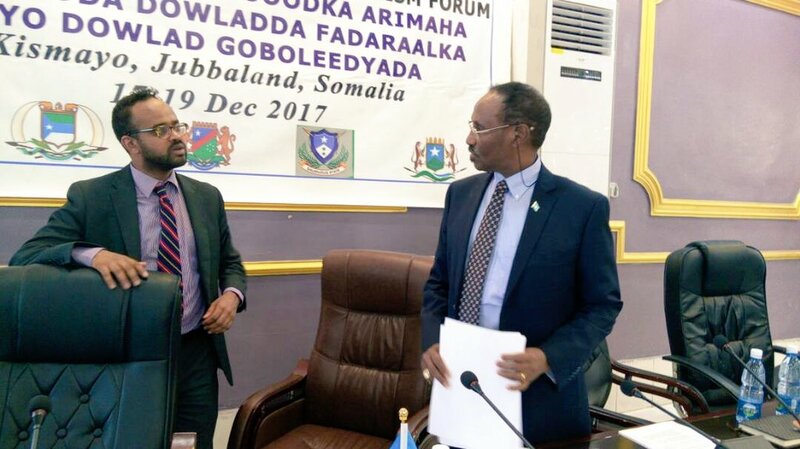 An example is its prominent former alumni Abdi Barud, who currently serves as an Adviser to Somalia’s PM. In fact, in addition to being a former Transparency Solutions employee, Mr. Barud has also worked at the University of Bristol as a researcher. 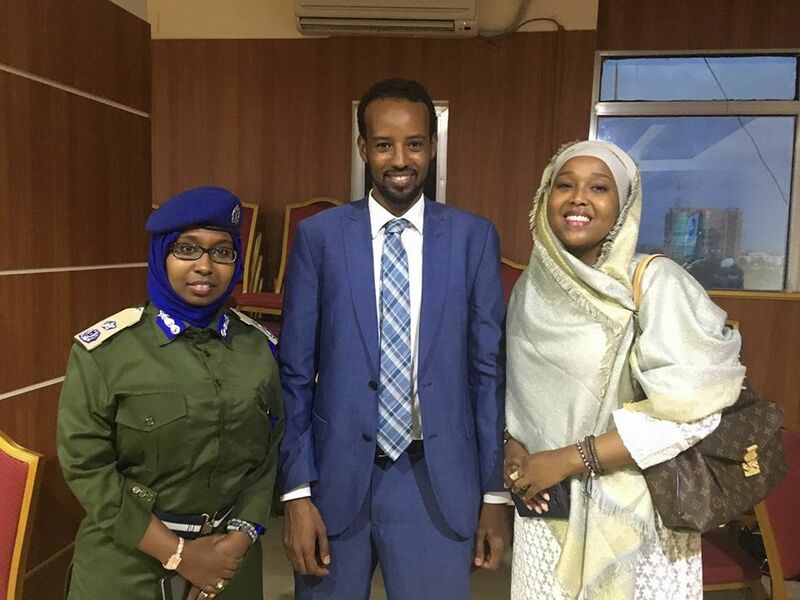 It is worth noting that Mr. Barud is one of the staunchest anti-Somaliland activists in President Farmajo’s and Prime Minister Khaire’s inner circle. 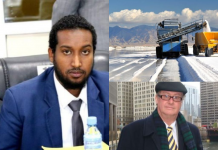 Mr. Barud is not the only high ranking official in the Somali Federal Government to have worked for Transparancy Solutions, there is also Mr. Liban Obsiye, another unionist originally from Somaliland who has worked with Transparency Solutions. In fact, Mr. Obsiye’s Linkedin profile still lists him as actively working for Transparency Solutions. 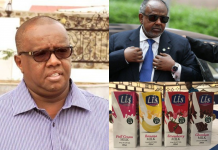 Mr. Liban Obsiye claims to be actively employed by Transparency Solutions. 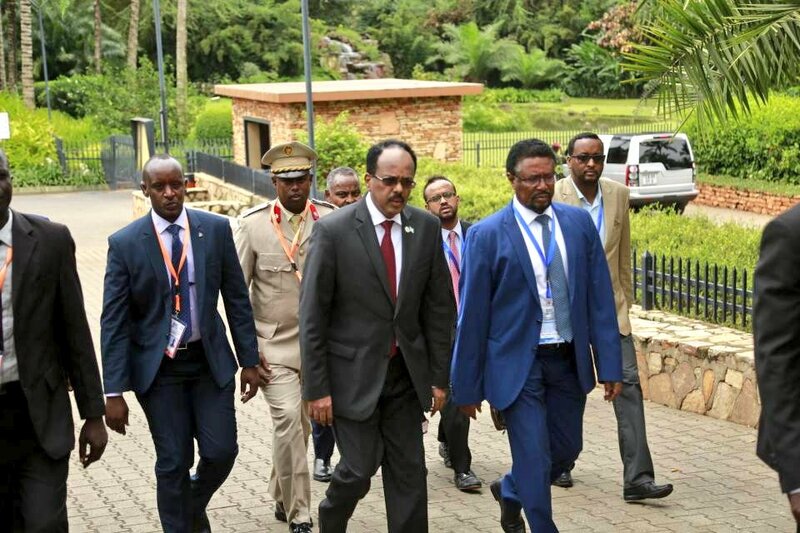 Mr. Obsiye with Farmaajo and other Government Officials from Somalia. 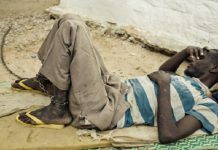 For an NGO, Transparency Solutions behaves in a peculiar manner that makes it look a lot more like a shell company than your average run of the mill NGO. It has gone through numerous permutations over the years, and has shut down various entities only to reopen them a short while later with a different name altogether; interestingly with the same two founders Mr. Latif Ismail and Alex Hall (more on Mr. Hall later). Before Transparency Solutions, there was Transparency Development, which was dissolved on September 15, 2015. 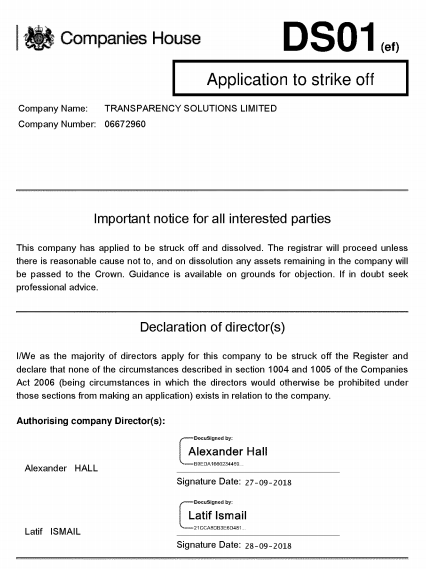 If we begin with Transparency Solutions Limited and its current status in the British companies register (otherwise known as Companies House), it’s easy to access and confirm the openly available information that it has actually been dissolved as of the 15th of January, 2019 via a voluntary strike off. Voluntary strike off in this case means the company directors Mr. Latif Ismail and Alexander Hall requested the company to be dissolved. 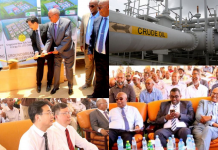 While the voluntary dissolution of an active company is in itself odd, what remains unclear is why it is still operational in Somaliland. 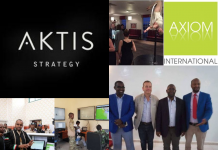 Transparency Solutions founder Mr. Latif Ismail is rather prolific for his relatively short experience in the security sector, and seems to have a lot of connections in the private security industry. 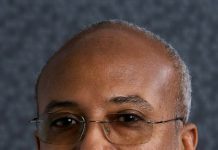 Recently, he has been involved with another entity – Horn Risk Management – that at one point managed the security of Hargeisa Airport and has been accused of improperly collecting a $20 “security fee” from all passengers using equipment donated by the UK Government’s Department for International Development (DFID) and installed by Adam Smith International. Though we are unable to substantiate detailed information received from our sources, Horn Risk Management has also been accused of sending passenger information (PAX details and itineraries) to overseas servers by the former Ministry of Aviation’s executive, prompting concerns of improper dissemination of critical and personally identifiable information to unauthorized and unkown third parties, causing their prompt removal from access to sensitive traveller data along with the subsequent loss of their lucrative contract. While we were unable to locate the registration of Horn Risk Management, the entity seems to have ceased operations, and their website is down (but archived) as of the writing of this article. We were only able to explore their existence further through their once-active LinkedIn profile. 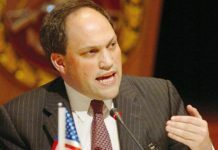 Additionally, Mr. Ismail has worked with yet another dubious private security firm known as Praetorian Connection. 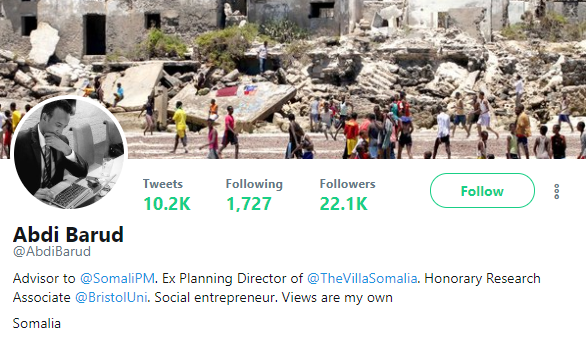 Mr. Hall, Latif Ismail’s cofounder at Transparency Solutions is a virtual ghost with almost no digital footprint despite the fact that he co-authored every paper that Mr. Ismail listed on his University of Bristol’s SPAIS profile. Mr. Hall’s lack of a digital footprint online, appears more of an intelligence handler’s attribute, than that of a prolific academic’s. 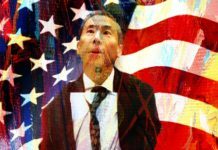 Mr. Latif on the other hand, has enjoyed a relatively quick rise to prominence in his field on the back of Mr. Hall’s extensive academic writing catalog. 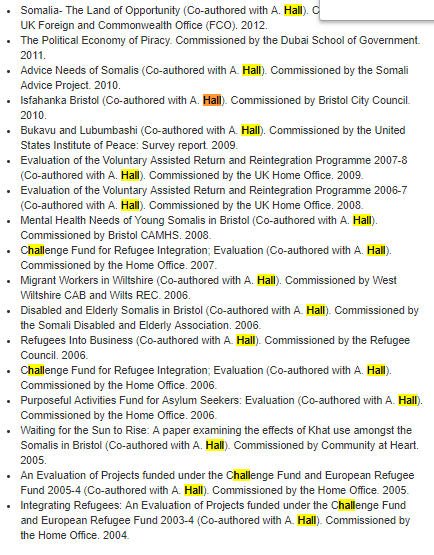 Another prolific writer Eric Herring, who according to his biography on the University of Bristol’s SPAIS profile is one of the co-founders of Transparency Solutions (but somehow unlisted on any registration documents), has been extremely visible in its activities such as being the face of the Somali First initiative, unlike the ellusive Mr. Hall. Even more peculiar are the other companies registered to Mr. Hall. Aside from Transparency Solutions, he operates multiple gambling interests by way of Betting Gateway Limited (07355733) as well as Elitebet Limited (10159311). According to many published autobiographies of prominent intelligence operatives, it is common knowledge that they have historically used either NGOs, charities or gambling operations to launder and move money in less sophisticated nations to finance their operational objectives. 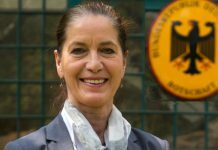 The tangled web of shady outfits does not end there, there is also the University of Bristol’s Global Insecurity Center which has the same exact operators of Transparency Solutions and Horn Risk Management, Fresh Ground Consultancy Limited (website) and similarly defunct Sweet Training Learning Consultancy Ltd where Transparency Solutions’ Sandra McNeil appears under her maiden name Sandra Jane Duck. 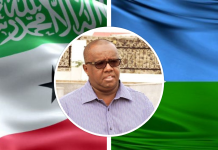 We have called Transparency Solutions’ office in Hargeisa Somaliland to get more information on Mr. Hall, to understand how they are registered in Somaliland, and various basic details a normal entity would readily provide. 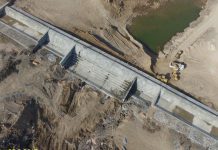 The unusually combative and defensive secretary questioned why we needed to know such information, and would not provide anything more than their website address as a referral. 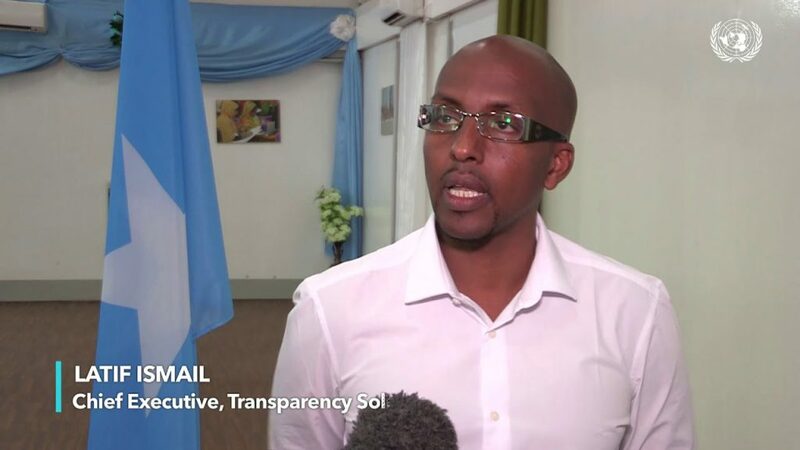 We have also reached out to former employees of Transparency Solutions such as Khadar Abdi, a prominent member of the UK Somali community, the Interim Secretary General of Somaliland’s strongest opposition party, who has worked with both Transparency Solutions and Horn Risk Management, and was a researcher with the University of Bristol’s SPAIS program; but he declined to make any comment and promptly disconnected our call. 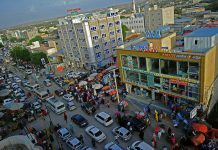 We have asked a number of high-ranking officials in Somaliland’s Government about Transparency Solutions including their operations in the country, and they were unanimous in their suspicion but declined to comment any further. 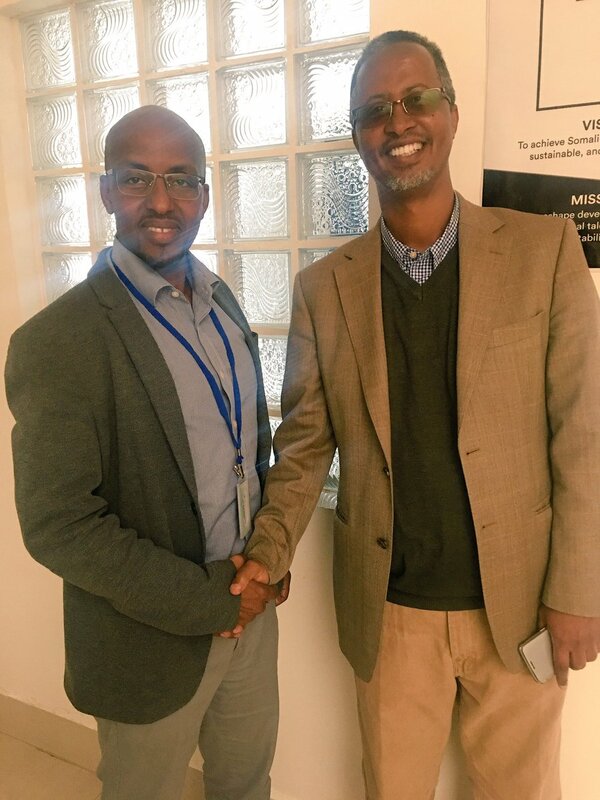 Furthermore, we were unable to find any indication that any reports on the sensitive research Transparency Solutions conducts, is shared with the Government of Somaliland according to various officials we interviewed. 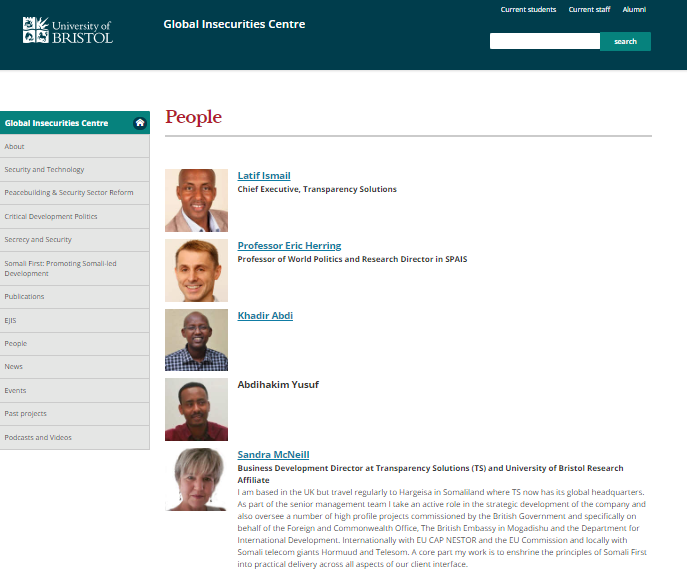 Another alarming anomaly that stands out about Transparency Solutions, is the number of University of Bristol graduates (and former researchers) associated with it; many of which are also associated with both its various initiatives and activities, and employment pertaining to Somalia and its government. This raises serious concerns and red flags, as the University of Bristol has been accused of links to British Intelligence in the past – specifically the GHCQ, where they were singled out in an explosive scandal in recent years. 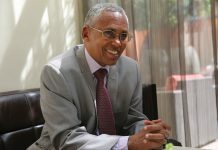 In fact, according to Mr. Latif Ismail himself, the stated goal of their various efforts is for the reconstruction of Somalia. 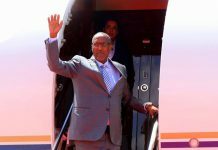 This leaves us with the obvious question: how transparent is Transparency Solutions and why are they still operating in Somaliland? Excellent investigative journalism. 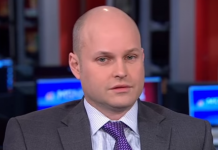 But, even during the union, we have had our share of turncoats & chances. Nothing new. 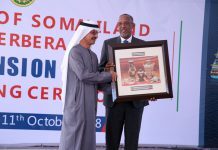 At the end of the day, Somaliland will appropriate their nice building & other assets, & ship them back to the pub’s of Bristol & the bunkers of Muqdisho. Lol this is precisely how not to write an expose of any sort. Not one single action is pointed to, with alot of innuendo like infowars when they talk about the earth being ruled by lizard people “X was seen witb Y and we all know Y keeps a large collection of lizards, this becomes intreasting when we notice most people keep cats and dogs as pets, Proving X has no problem around lizards”. Anyway continue with your fake news in support of your 1 clan republic. You are filth and probably jelous of this mans acheivements at such a young age while you write nonsense in hopes of harming a dynamic group of people. What is the purpose of the photo of Mr. Latif with Mr. Eid, other than to plant a shady image of Telesom? 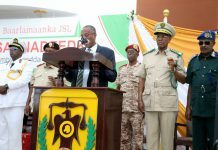 Believe me, Somaliland toban sano ka bacdi ma sii jirayso haddaad caacdaas dayn weydo. There are still a couple of agencies who are engaged in similiar activities. 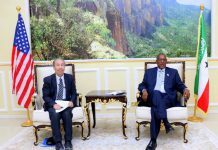 But Somaliland authorties are only actively pursue to silence those who expose their blunders and corruption.